Are you itching to live and play golf on Tallahassee's most competitive golf course? If so, then most local golfers would refer you to Golden Eagle Plantation in Killearn Lakes. Golfers will tell you the Tom Fazio gem of a golf course is reason enough to move to this popular NE Tallahassee neighborhood, but residents also enjoy the atmosphere of living within Tallahassee's only gated, golf-course community. They are attracted to the privacy and the country club lifestyle. If you want an intelligent view of the housing market in Golden Eagle, then consider average home price trends, home value trends, as well as home size trends, and then look through all the Golden Eagle homes currently listed for sale in the Tallahassee MLS and review every past home sale going back to 1991. It is important to note that the narrative contained below is for sales through December for all previous years, but through the first week of October in 2015. The graphs and the closed sales table will be continuously updated into the future (meaning bookmark this page if you always want to know the current status of homes in Golden Eagle Plantation). Average home prices are roughly the same this year as they were last year, but still well above the lows seen in 2012 and 2013. Prices remain 23% below the peak of the market prices established in 2007 (not counting the one atypically large sale in 2009). The average recorded sales price is $450,200 for Golden Eagle Plantation thus far in 2015. Home sales activity in 2015 has been relatively robust, as the number of sales indicates a annualized pace that is one of the best of the past ten years. Unfortunately, the current rate of home sales remains well below the levels recorded during the most active years from 2002 through 2005. 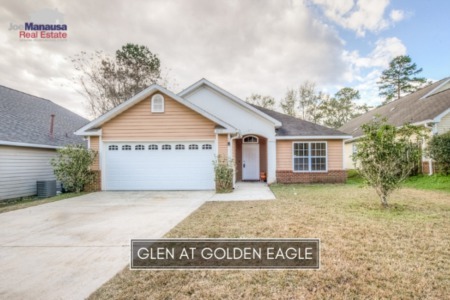 Thus far in 2015, there have been 39 closed home sales in Golden Eagle Plantation. Average home values in Golden Eagle Plantation have only moved slightly higher in 2015, up less than 1% over last year. Through the first week in October, the average value of a home sold in Golden Eagle Plantation has been $140 per square foot. This is up 9% over the bottom reached in 2013, but still down about 22% from the market high set back in 2006. This means that many homeowners who have purchased or refinanced in the past 10 years owe more on their homes than they could get with a sale today. 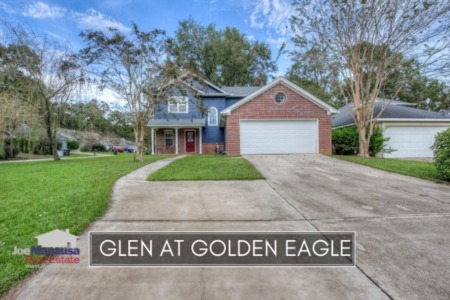 The average home size sold in Golden Eagle Plantation typically falls in a range of 3,000 to 3,500 square feet, and this year buyers have been selecting homes near the middle to lower end of that range. The 39 sales thus far in 2015 have averaged 3,140 square feet. The following list shows home sales going back to 1991 in Golden Eagle Plantation. I hope you enjoyed our October 2015 update on home sales in Golden Eagle Plantation, please feel free to drop me a note if you have questions not covered in this report.